As much as I poke fun at the relic craze, it must be getting to me. 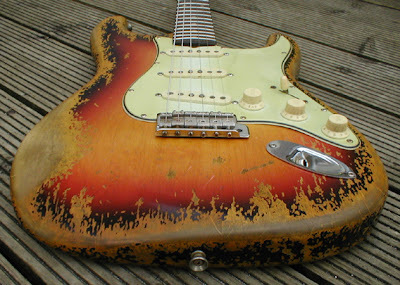 Of all the relic-aged-distressed guitar builders and sites I've seen so far (quite a few! ), John Elliot's Bravewood Guitars site is the ultimate. CLICK HERE for the "S-Type" (Strat) section and click on the images of the various featured units, for full galleries. There's also a Tele section and some beautiful non-relic pieces-- remember non-relic guitars? I'm tellin' ya, this stuff is gettin' to me. Elliot's work is just too good! I especially appreciate the Bravewood stuff after recently looking at the REAL vintage inventory over at Guitarville by Vegas. Elliot's Bravewood site is like relic guitar p*o*r*n. And there ain't a single headstock to be seen... I'm imagining fake Leo F. fingerprints placed on the pickguard undersides of these guitars. They actually look OLD, not just dinged up and discolored in spots. Any one of them could have spent the last 40+ years in Rory Gallagher's basement, under a dripping Guinness tap. Oh yes, these guitars are made from scratch too. In other words, John Elliot cuts his own bodies and necks from planks of wood. The recent commentor who referred me to Bravewood, claimed to own two BW guitars, plus 2 more on order. He also said he owns some Nash guitars.